Last seen in TV serial Jackson Heights, Aamina Sheikh has been missing in action for some time now; be it fashion runways, TV commercials or drama serials. But this beauty had her hands full with another project — motherhood. 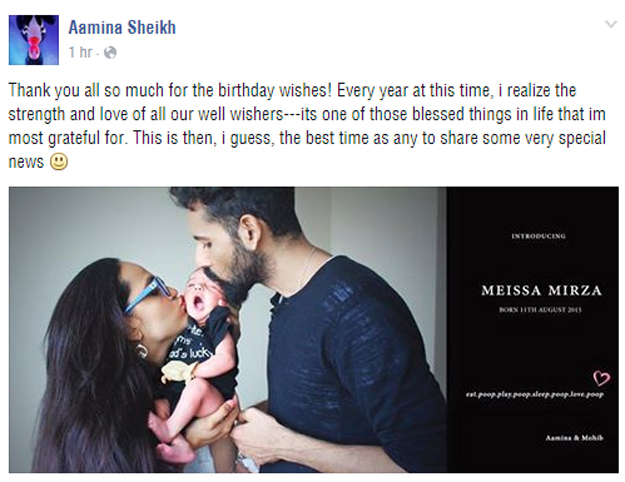 Aamina took to Facebook to announce the arrival of her baby girl, Meissa Mirza. The actress along with her husband Mohib Mirza welcomed their first child on August 11. The picture captioned “eat.poop.play.poop.sleep.poop. love.sleep” sums up the duties of the newest mommy in town. Aamina and Mohib have been married for almost 10 years and have worked together on a number of projects.